Townsend Leather Company has been fortunate to work with Roger Thomas, recognized leader in interior design for the hospitality industry, on several product lines he designed. The first such product line was our Faux Parchment Lambskin. Mr. Thomas came to Townsend with the vision of updating the classic beauty of genuine parchment made popular by Jean-Michel Frank in the 1930’s. The Faux Parchment Lambskin leather created for this collection invokes the look of genuine parchment, but with a soft supple feel, suitable for wall covering or upholstery use. Skins are selected from Townsend’s finest aniline-dyed lambskin reserves for specific grain properties that will allow for the sophisticated sauvage look that is essential to the product’s integrity. From there, all color is hand-applied and built in layers of hues that accent the natural markings, graining, and beauty that become the “pattern.” The skins are then sealed with urethane for added protection. Similar to genuine parchment, Faux Parchment Lambskin will change and develop a beautiful patina over time. The Faux Parchment Lambskin Collection by Roger Thomas Collection is now available to the trade with 3 standard colorways. Mr. Thomas designed 2008’s Architectural Digest Academy Awards Green Room in which the Faux Parchment Lambskin leather was featured on wall panels of the “old –Hollywood- glamour-inspired” room. The look was met with much positive feedback and became the impetus for a full product line to be developed by Roger Thomas Collection and Townsend Leather. In 2010, Mr. Thomas also incorporated this leather into the Baccarat Room in the Wynn Hotel & Casino in Las Vegas. In the last year, Townsend Leather also launched an additional Roger Thomas signature collection featuring a range of large-scale, damask embossed leathers. Townsend Leather is known for elevating leather from a commodity product to a truly unique design tool. Mr. Thomas shares this same passion, creativity, and sense of luxury, creating a unique partnership with Townsend. Mr. Thomas is a recognized leader in interior design for the hospitality industry. 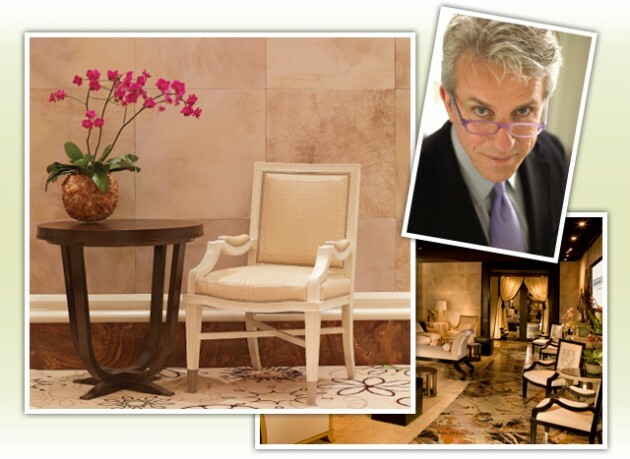 As Executive Vice President of Design at Wynn Design and Development, Mr. Thomas has most recently created the interiors of such iconic properties as Wynn Las Vegas, Encore Las Vegas, Wynn Macau and Encore Wynn Macau.